Today's recipe is another from CBeebies 'I Can Cook'. I know certain people will be horrified by my choice of this recipe as it is rather heavy on the sugar content. But, because I am a sensible mummy and feed my child a healthy, balanced diet (when I can!) and as a reward for her choosing to eat the remainder of yesterday's Flash Loaf (another Dan Lepard recipe), I let Miss A loose in the kitchen to make Banana Toffee Pudding. It's basically a take on a traditional sponge topped pudding - the kind of thing I used to get as a child for pudding on a Sunday. It makes me a little sad that life has changed and we don't have a traditional family dinner around the table at Sunday lunchtime. That said, I don't really like roast dinners enough to eat them every week and it's a lot of effort to do for just two - especially with all the washing up. We probably have about two roasts a year in this house - one of them being Christmas dinner. So as a little family bonding exercise, I decided to allow this treat. Because it's a kids recipe it makes four small portions and with the high sugar content I don't think even an adult could eat that much (well there are times when I probably could eat the whole thing myself!). 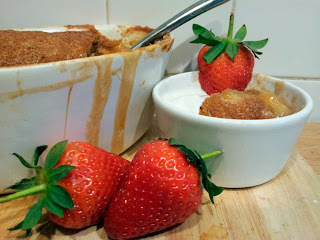 To balance all the naughtiness out, I served it with low fat Greek yogurt (good source of calcium for my milk-hating child) and fresh strawberries - one of the five a day and the slight acidity worked well against the sickly sweet pudding. Had my sous chef not eaten one of the bananas during prep, I'd've also served some fresh chopped banana with it. But I could hardly complain, could I? Pass me a spoon, someone! The base of the pudding is toffee sauce. 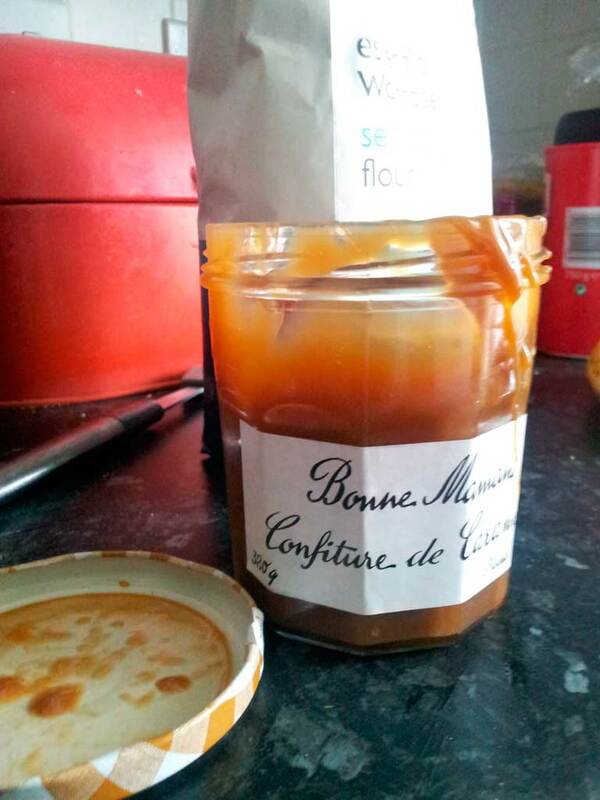 My latest and greatest food find is Bonne Maman Confiture de Caramel. Basically Dulche de Leche or Toffee Sauce but in a screw top jar rather than all those annoying tins of caramel that the shops seem so keen to peddle. They're fine if you need the whole lot for a recipe, but if you only need a spoon or two, as in this case, you have that old half-opened-tin-of-something-stuffed-in-the-back-of-the-fridge-and-then-it-eventually-gets-knocked-over dilemma. Or is that just me because I'm a bit of a slummy mummy? Anyway, caramel in a glass jar is a winner. I just have to resist taking the jar and spoon to a secret corner when I'm having a bad day. My sous-chef's new skill of the day is banana chopping. I love watching her develop her fine motor skills. To start with, the poor bananas were just bludgeoned to a pulp but a bit of input from mummy and we ended up with arty chunks. In they went on top of the toffee. The sponge is a simple, even mix of flour to butter to sugar to egg (70g of each). I adapted the recipe slightly to fill my pie dish so used 100g of each, an egg and 30ml of milk to slacken the batter off. Then it's just into the oven at 180c for 35 minutes (in my case as I used a deep dish). And out came a light, fluffy sponge with a banana flavoured toffee base. Perfect. Oil the sides and base of an oven proof dish. Place on a baking tray and add the toffee. Lay the banana slices on top. Cream the butter and sugar together. Add the beaten egg and mix well. Mix in the flour, mixed spice and the milk until well combined. Scoop the sponge mixture into the dish on top of the bananas and smooth out with a spatula. Place the dish in the oven for 25-35 minutes (depending on the depth of your dish) until the sponge is well risen and springs back when touched. I turned the heat up for the last five minutes of cooking to get a nice crispy top on mine. Serve with fresh fruit and yogurt.